The Skylon, which is being developed at the Oxfordshire-based Reaction Engines in the UK, is an unpiloted and reusable spacecraft that can launch into Low Earth Orbit after taking off from a conventional runway. 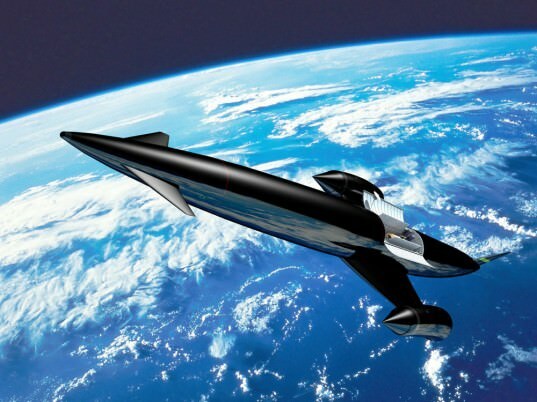 Looking like something out of Star Wars, Skylon is a self contained, single stage, all in one reusable space vehicle. There are no expensive booster rockets, external fuel tanks or huge launch facilities needed. The vehicle’s hybrid SABRE engines use liquid hydrogen combined with oxygen from the atmosphere at altitudes up to 26km and speeds of up to Mach 5, before switching over to on-board fuel for the final rocket powered stage of ascent into low Earth orbit. The Skylon is intended to cut the costs involved with commercial activity in space, delivering payloads of up to 15 tons including satellites, equipment and even people into orbit at costs much lower than those that use expensive conventional rockets. Once the spacecraft has completed its mission, it will re-enter Earth’s atmosphere and return to base, landing like an airplane on the same runway, making it a totally re-usable spaceplane, with a fast mission turn around. Skylon has received approval from a European Space Authority panel tasked with evaluating the design. “No impediments or critical items have been identified for either the Skylon vehicle or the SABRE engine that are a block to further development,” the panel’s report concludes. The UK Space Agency says that Reaction Engines will carry out an important demonstration of the SABRE engine’s key pre-cooler technology later this summer.